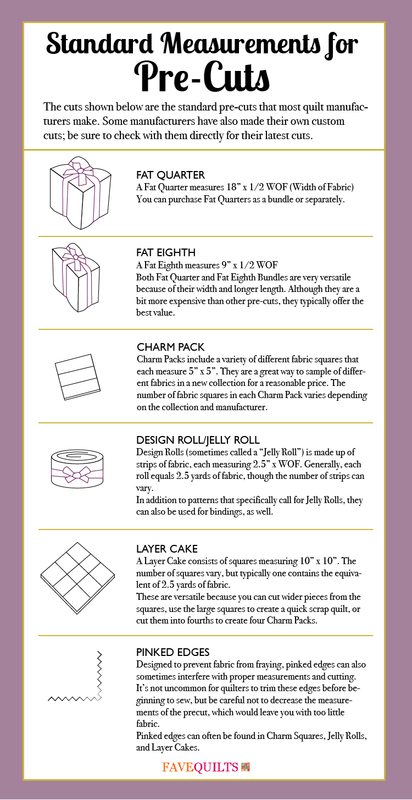 Today we are bringing you a pair of handy infographics that are perfect for the quilters out there. 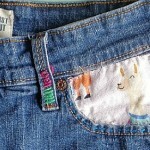 First, learn 10 ways to cut a fat quarter, so you won’t waste a single scrap of that coveted piece of fabric. Just in case you have ever wondered “how many squares can I cut from a fat quarter?” you’ll never have to wonder anymore. 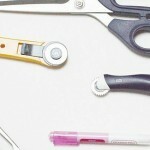 Have you ever wondered about those pre-cut bundles of fabric that you see at the store? Use this free printable explain everything for you. Print it out and you’ll always have the information handy. A bundle of coordinating 5×5″ squares, ready to go for piecing that quilt. This is a roll of fabric (sometimes folded, depending on the manufacturer) cut 2.5″ x Width of Fabric. Many coordinating fabrics are combined, making this a great deal for a quilter who wants variety. For those who need versatility in being able to choose the size of your cuts but still want the variety that a fabric bundle offers, this bundle of 10×10″ pre-cut fabrics is for you. Each of these images, when clicked, will open in a new window, ready for you to print and pin up next to your cutting table, so you’ll never forget everything you need to know about pre-cut fabrics. 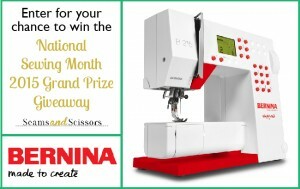 What size pre-cut do you use most often? Thanks for the handy charts! I prefer to use fat quarters when buying pre-cuts. 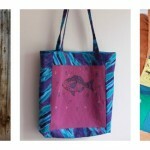 They can be cut into strips, squares or even applique patterns. Always easy to handle too! I really like jelly rolls. Seems like I have more patterns for this precut. I like to use the precuts for machine applique. Thank you for gathering all the handy charts for precut bundles. This, and others comments, are helpful. I didn’t know the difference between the packs. I like the hand outs. So far, the only precuts that I’ve used have been fat quarters. I have only used fat quarters. I have used charms and fat quarters. I love fat quarters best, can never have too many. I have only ever made crazy quilts out of found scraps so I don’t have a go to pre cut. The charts are going to help me when I jump in to actual quilting. I use fat quarters the most. Thanks! I live in a small town. I was in my local store the other day and they had a new display with about half the sizes you me mentioned. I finally get to find out which sixes I like instead of being by the yard or searching through remnants. I love layer cakes. You can put a print and solid layer cake together and get a big quilt pretty quick. Thanks for the great charts! My understanding is that a fat quarter measures 18″ x 22″ NOT 18″ x WOF and that a fat eighth measures 9″ x 22″ NOT 9″ x WOF. 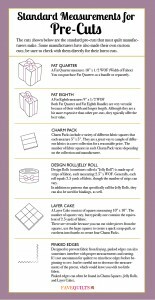 These measurements are misstated in both the body of the article and in the printable chart and could be very misleading to those new to the quilting or pre-cut world. Good idea but not correctly stated. 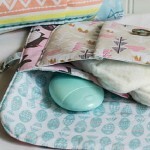 I use fat quarters mostly. I like having enough fabric for larger projects as well as smaller ones. 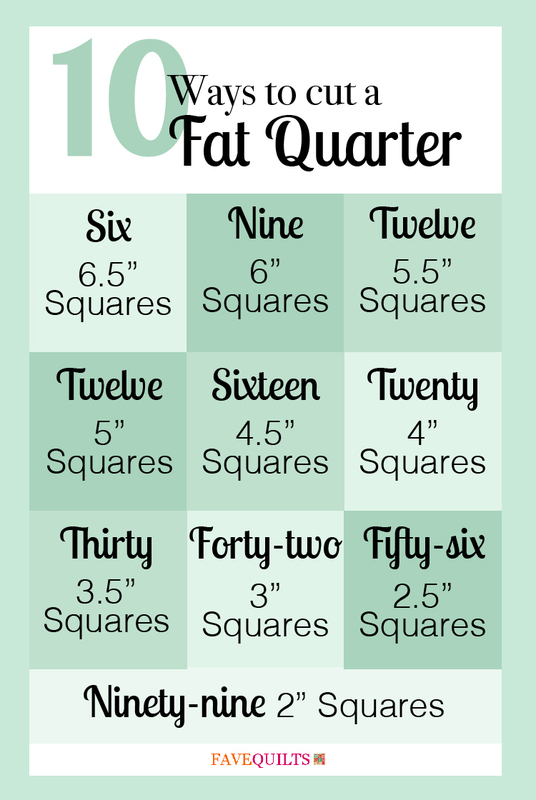 In your chart on measurements a fat quarter is listed as 18″ X WOF, that is wrong WOF is usually about 42-44″, so a fat quarter is 18″ X 22″ or 9″ X WOF. Also the fat eighth is listed as 9″ X WOF, that is wrong that should be 4.5″ X WOF or 9″ X 22″. Thank-you for correcting this! 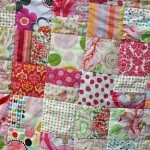 I have only used fat quarters, but I want to try a jelly roll. Have a great day! I use fat quarters mostly. Thanks for the charts, they will come in handy. I usually buy fat quarters, and jelly rolls, But I prefer yardage. That way I have more than enough and build up more stash. Not that I really need it. LOL Smile everyone. I use FQ to do piecing. 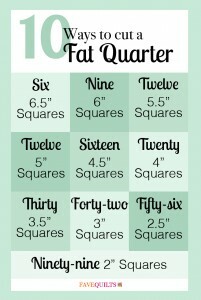 You have a misprint in your fat quarter chart; a fq is 18 inches x 1/2 wof, usually 22 inches. And a fat eighth is also x 1/2 wof. I’m sure it was just a typo. Thank you for all you post, I love site! I like all the precuts but I think my favorite are the Charm Packs. Thanks for the great giveaway. I’ve only used charm packs so far, but have a fat quarter bundle waiting to try. 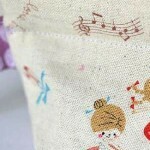 I love fat quarters best but nice to know how many other things can be cut from one! I like jelly rolls too! I use all the precuts and love them all! I just finished a quilting project using jelly roll strips, and hope to use a layer cake for my next project! I have lots of each size in my stash! Have never had occasion to use precuts. I use jelly rolls the most. I have a lot of patterns for these.